10. Carlos Torano Exodus 1959 Silver – It’s easy to see why the Silver line is one of Torano’s best selling lines. It has a pleasant pre-light aroma, an enticing brownish lead wrapper that is oily and mostly smooth, and an excellent medium to full body taste. The burn and draw are practically flawless, as was the silverish ash. At $6.50 per cigar, they can be a go-to for most smokers. 9. Casa Magna Colorado Gran Toro – Called “colorado” meaning colored in Spanish, this Nicaraguan cigar has a dark, slightly reddish hue, and a full bold flavor. The best parts about the Gran Toro are the sweet-raisin and cocoa aroma and the deep, wet-earth taste. Plus, at $5.25 a pop, you can’t find a better price. 8. Don Pepin Series JJ – This cigar has limited availability since it is made in Don Pepin’s small Miami factory, but if you can get your hands on one make sure and do so. It’s a full bodied cigar, with a full flavored spicy aroma that is balanced out by notes of leather. The cigar as some heat, but it isn’t overpowering. Since they are hard to come by one of these will cost you $10. 7. Indian Tabac Super Fuerte Gordo Maduro – A huge cigar with a ring size of 58, the Indian Taban Super Fuerte Gordo Maduro feature a maduro wrapper that doesn’t overpower and a quality medium to full bodied smoke. The flavors are rich and round. An elegant cigar, the smoke is nutty and spicy, with a creamy rich flavor that has just a hint of chocolate. You can try one for just $5. 6. 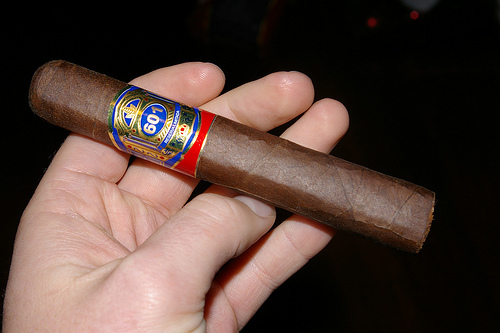 601 Blue Box-Pressed Maduro – Naturally sweet, this cigar uses Cuban-seed Nicaraguan long fillers and a Nicaraguan maduro wrapper, which adds to the sweetness. The box-pressed shape results in a nice even burn, and the smoke is thick, creamy and spicy-sweet. Big strong flavors, very full bodied, and each puff is full of spice and pepper. A little on the pricier side ($10 per) it might be cheaper to buy a box or get it as part of a sampler. 5. 5 Vegas Cask-Strength II – Opening strong with a flavorful bouquet packed with hearty spices, the 5 Vegas Cask-Strength II nicely paves the way for hearty oaks, cedar, toast and earth flavors. Full-bodied, with big bold flavors, this cigar packs quite a punch for only costing $6.75 a piece. 4. Fonseca Habana Seleccion Cosacos – This rare commemorative cigar is wrapped in a Habana Criollo wrapper that has been aged at least 5 years. It is only available in a dozen or so retailers worldwide, but if you manage to get your hands on one, you’re in for a treat. Nice spicy flavors and good smoke body from the first puff, this cigar is packed with heat and lingers long after every puff. Robust and with a strong visit this $5 cigar is worth looking around for. 3. Don Pepin Garcia Cuban Classic – The Don Pepin Garcia Cuban classic is full bodied and full flavored, making it reminiscent of a fine Cuban cigar. The aroma is dry and spicy, with a clear finish. The strongest hints are of earth, toasted cedar and black pepper. This cigar is perfect for someone looking for a powerful smoke. Originating in Nicaraugua, Don Pepin Garcia Cuban Classic’s cost about $8 each. 2. 5 Vegas Triple-A – The first thing you’re likely to notice about the 5 Vegas Triple-A is how heavy it is: that is because it is so densely packed with premium Nicaragua ligero leaves. It comes with a powerful burst of spice and pepper flavors, a beautiful dark brown wrapper, a nice tight ash and an even burn. There are hints of oak and leather, and espresso and cocoa flavors. This Nicaraguan Cigar will run you about $7. 1. Rocky Patel Puro Cubano – The bold, well-aged blend comes from the full-flavored tobaccos of Nicaragua and the Dominican Republic. The spicy, Habano wrapper adds quite a bit of complexity to an already flavorful combination of earth and sweet flavors intermingled with light hints of pepper. Medium bodied, you’ll also notice a leather and espresso finish on the blend. This cigar hails from the Dominican Republic and costs about $7. Why I switched from a cartridge to a safety razor…forever!